Submitted by JoeKeresztury on Fri, 03/04/2011 - 08:02. A Ground Fault Circuit Interrupter (GFCI) is designed to protect people in their homes from fatal or severe electrical shocks but also. Since a GFCI, also known as GFI detects ground faults, it can also prevent some electrical fires and may reduce the severity of others by interrupting the flow of electric current. The GFCI is an electrical safety device that, if installed in a homes branch circuits, could prevent over two-thirds of the nearly 300 electrocutions still occurring each year in and around homes according to the Comsumer Product Safety Commision. Kitchen counter areas along with receptacles within 6' of wet bar or utility / laundry sinks and all bathroom outlets are required to be GFCI protected. They are also neccessary and required at any exterior outlets and all garage receptacles. Garage dedicated outlets are no longer allowed to be non GFCI according to current, updated standards. In the home's wiring system, the GFCI constantly monitors electricity flowing in a circuit, to sense any loss of current. Electricity flows, for example from a wall receptacle through an appliance that is turned on and then back to the receptacle. Normally, the same amount of electricity that flows from the receptacle returns to the receptacle. As long as the currents are balanced, the GFCI allows current on the circuit. If the current flowing through the circuit differs by a small amount from that returning, the GFCI quickly switches off power to that circuit. Solid state circuitry connected to a sensing coil activates a trip mechanism, and the circuit is interrupted (tripped). The GFCI interrupts the power within 1/40th of a second, faster than a blink of an eye to prevent a lethal dose of electricity. You may possibly receive a shock, but you would not be electrocuted or receive a serious shock injury. Ground fault shocks can range from a light tingle, to almost instant electrocution. 10 milliamps of ground fault shock, which is 10/1000 of an ampere, not even enough to light a Christmas tree light bulb, can cause a muscle contraction that will keep a victim from being able to release his grip on the faulty device or wiring. This is called "let go current." 30 to 200 milliamps makes breathing difficult and unconsciousness possible. 380 milliamps, only 1/3 of an amp, barely enough to light a basic 60 watt light bulb may kill. So, even a low amperage ground fault shock can be deadly, however a Ground Fault Circuit Interrupter (GFCI) would safely limit the duration of ground fault shock exposure. GFCI shuts off the electrical power to the receptacle normally fast enough to prevent serious injury. GFCIs should be tested occasionally to make sure they are working properly and protecting the circuit, while also protecting the home owner from fatal shocks. To test the GFCI receptacle, you can use a GFCI tester, available at your San Antonio area Home Depot or many other stores. If you don't have a tester, then you can test the GFCI by using an electrical, plug in fixture, such as a lamp. First plug the lamp into the outlet, then turn the light on. Now press the TEST button on the GFCI. The GFCI's RESET button should pop out, and the light should go off. If the RESET button pops out and the light stays on, the GFCI outlet has been improperly wired. If the RESET button does not pop out, the GFCI outlet is defective and should be replaced. A qualified electrician should be called to replace the outlet and / or correct the wiring. 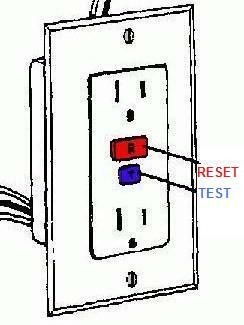 If the GFCI is properly working, and the lamp goes out, press the RESET button so as to restore power to the outlet. So in conclusion, in your San Antonio area home it would be best to make sure these proven life savers, GFCI protection devices are installed as per current reqirements, including all wet areas, areas susceptable to being wet and any areas that may have potential for electrical shock. A Ground Fault Circuit Interrrupter is an inexpensive electrical device that when properly installed in household branch circuits, could prevent electric shocks resulting in minor injuries, serious injuries or even fatal injuries.